Welcome to www.nutheme.com. 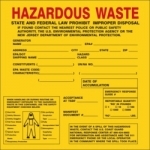 We are a manufacturer of safety signs, labels and related products. Nutheme was incorporated in 1946. We are a small company with an "aim to please our customer" attitude. Stocking over 1,000 different types of signs and labels in a variety of materials, along with other related safety products, we ship most orders within 24 hours of receipt. We are proud of our top quality merchandise and fast service. You can easily find products by selecting the category you would like to browse from the menu on the left.